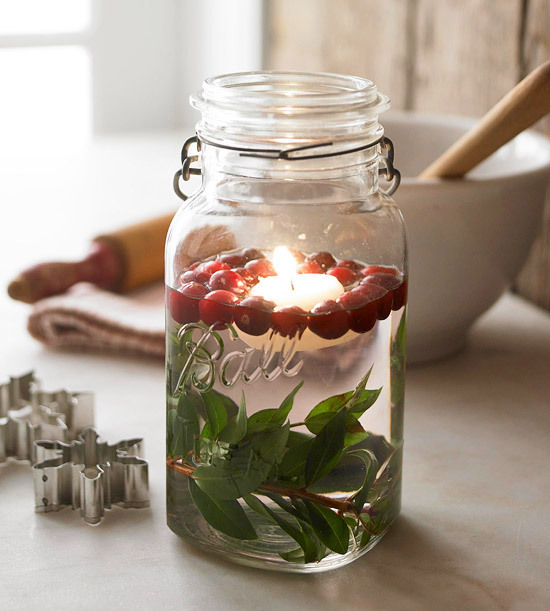 If you are looking for an inexpensive, but beautiful Christmas centerpiece idea, I love these mason jar Christmas candle holders. A little greenery, some cranberriers, and a candle all floating in a mason jar. You have all of the important colors, you have candle light, and you have a mason jar. Throw a couple of cookie cutters down like confetti and you are done. You can find more Christmas centerpiece ideas over at Better Homes and Gardens. This is beautiful! Can't wait to make them! Not sure about the cookie cutter part, but love the jar!